Comedy, tragedy, romance, mistaken identities, and misalliances — it’s all here in a unique collection of readers theatre scripts. These thirteen scripts from Weekly Reader’s Read Magazine feature age-appropriate adaptations of Shakespeare’s best-known works such as King Lear and A Midsummer Night’s Dream. 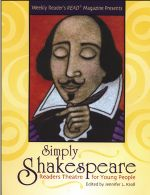 While preserving the flavor of Shakespeare’s writing, the language has been modernized so that young readers can easily understand and appreciate the plot and characters. Each adaptation is accompanied by a summary, presentation suggestions, and a character list. The text can be used independently or in conjunction with classroom units on Shakespeare. These easily performed plays will engage and entertain your students for years to come.